Beer For Dolphins (Keneally, Beller, Panos) have completed their grueling yet ecstatic month opening for Steve Vai on his American tour. Obvious Moosereaders' exciting tales of MK/BFD in concert are compiled in the Keneally KoncertKopia! In the latest Life Of Bryan, Our Boy struggles to make sense of it all. 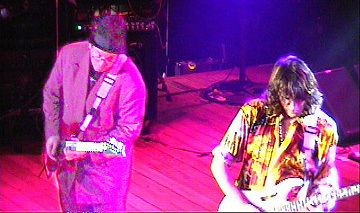 (Photo taken remotely on the internet on 12/7/96 by Brian Lagerman using the HOB's Spy-Cam.) Check out the full page of additional MK/BFD/Vai cyber-shots taken by Joe D'Andrea, Andrew Fignar Jr., Christian Heilman and Lagerman! The live Beer For Dolphins double CD "Half Alive In Hollywood" and the amazing BFD documentary video "Soap Scum Remover" are still available (despite temporary tour shortages) and selling briskly. This is Mike backstage in Ventura after BFD's first opening gig of the Vai tour. Wanna hear the message he left on The Moose's answering machine the morning after? It's a 49k RealAudio file. 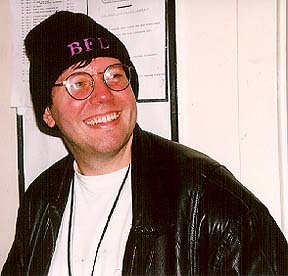 About a week later, Mike called again to say that he was still having a wonderful time even though the tour bus burned up (hope you weren't too fond of those glasses) and that before he left, he painstakingly transcribed all the words (grunts n' noises included) from "Half Alive In Hollywood" for you. Here lies an audio greeting from BFD bassboy Bryan Beller at the Gumbo Shop in New Orleans from 12/1/96! It be a 61k RealAudio file. Edit out the front part and tell your friends that Bryan called YOU! And on 12/11/96, Beller and Panos gave us the inside poop on the mood-altering break-in that colored the Indianapolis BFD gig. It's a 68k RealAudio file.